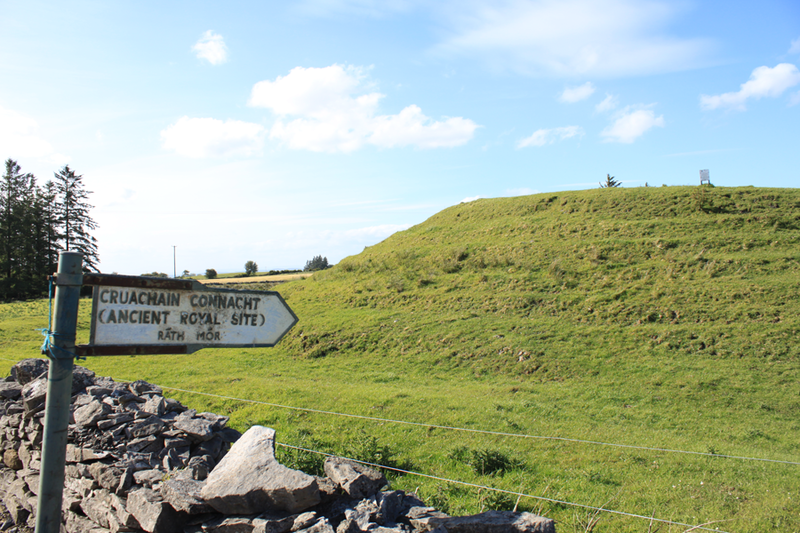 Guest blogger for this post is Mike Croghan, owner of Rathcroghan Tours. He’s from Bellanagare in County Roscommon. 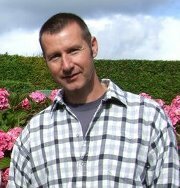 Mike is an artist as well as a guide will be leading our group through the Rathcroghan sites on day 6 of the Thin Places 2012 tour. 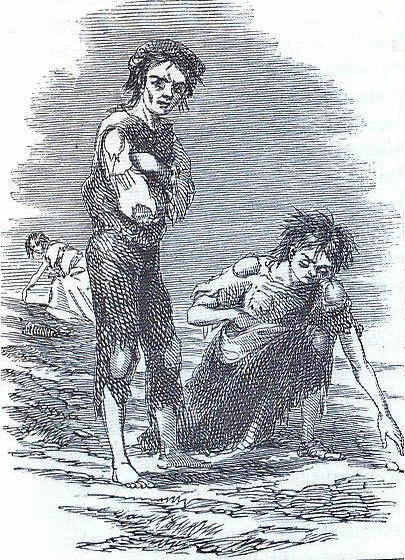 I’m the luckiest man in the world – I really am, I’m a Croghan and I live on Rathcroghan. To those who may not have heard of Rathcroghan (that would be 99.9% ), it is one of Ireland’s greatest hidden gems, a landscape that is both physical and mystical, the Tara of the west, home to the goddess Medb, the epicenter for Celtic spirituality……and more. I clearly remember sitting at the window looking over at a nearby hill whilst eating my dinner – I was 7 years old. What had my attention was a ring fort on the hill top, I can remember wondering what it was before turning my attention back to the spuds. 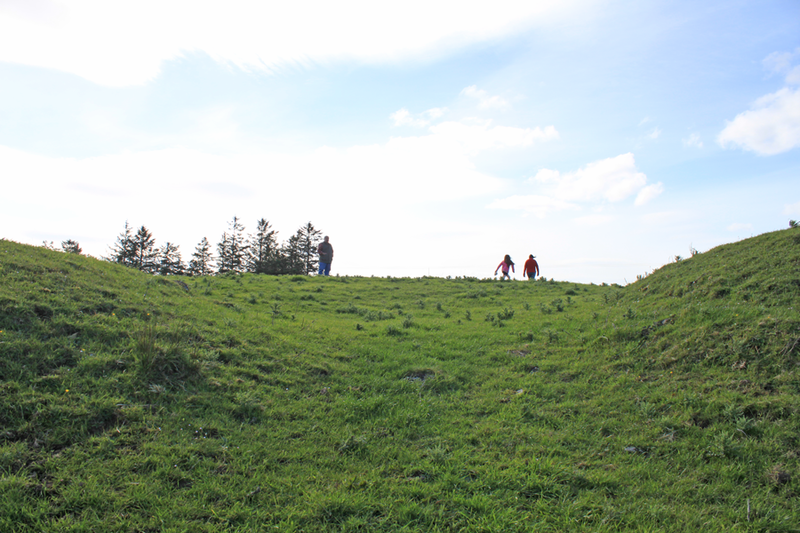 Approaching one of the Rathcroghan mounds. Over 40 years later I still wonder about that ring fort, what was it used for, why was it placed there, who lived there; my problem is that I am asking the same question about the other 140 monuments on Rathcroghan and it has taken over my life. You see Rathcroghan has the highest density of earthworks in Europe and they sit on the landscape, untouched in their original state teasing me with their enigmatic presence. 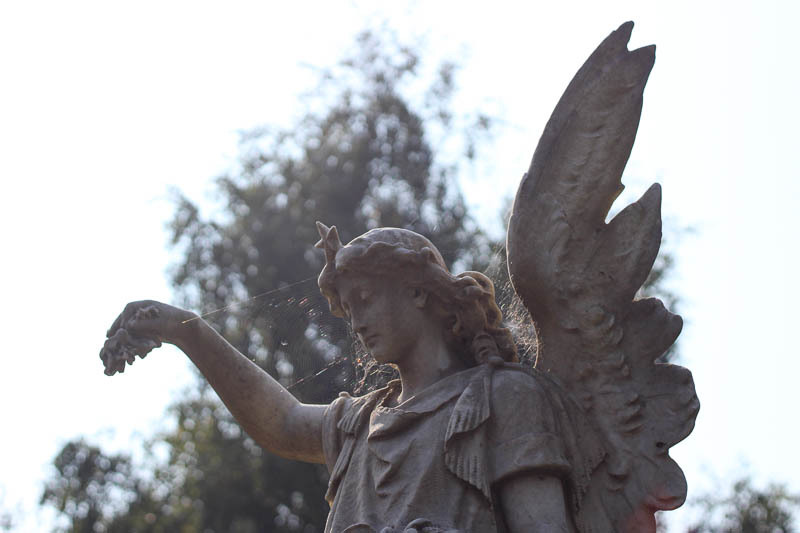 The monuments are wrapped in myths and legends, some are named after long dead kings or heroes, others hold the secrets to the otherworld, more have names associated with ancient tales and stories. For the archaeologist Rathcroghan is a gold mine of monuments dating from as far back as the Neolithic period all the way through the bronze age, iron age, right through the medieval periods to today, so many different styles of monument – raths, cairns, barrows, ring forts, ceremonial mounds, caves and standing stones. If you approach Rathcroghan as a spiritual pilgrim looking for a connection then you have hit the mother load. The integrity of this landscape has remained intact over the millennia as have the energies within the land. In fact the area only really makes sense when viewed as a ritual landscape. 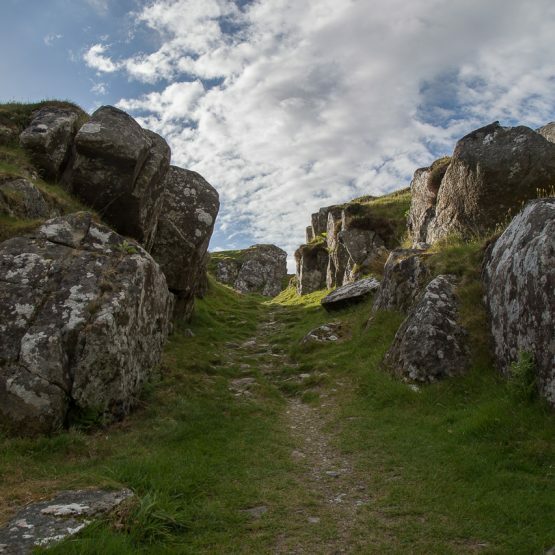 While other Celtic capitals hit the headlines and receive thousands of visitors each year Rathcroghan sits and waits for the inquisitive pilgrims to search it out, allowing only the true path walker to find it, this may sound poncy but it really is true. The greatest thrill for me is to be able to introduce these seekers to the area and let them see for themselves just how special the area is, as I said, I’m the luckiest man in the world. And I still love the spuds. 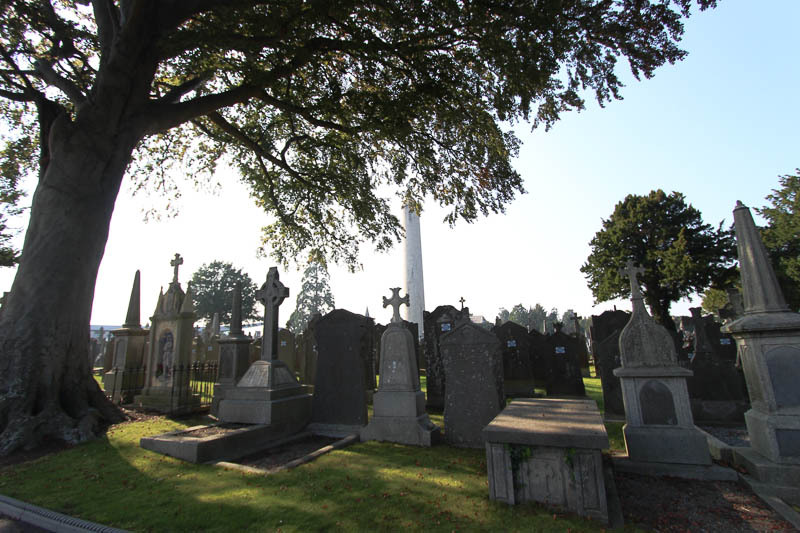 Learn more about Rathcroghan at Mike’s website – Rathcroghan Tours. His website includes some video and audio with photographs and text. 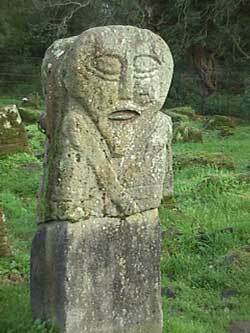 It’s a great resource for those wanting to know more about this remarkable complex of sites. County Clare is one the most visited areas on tours of Ireland, and the Burren is a worthy destination for any traveler to the West. The Poulnabrone Dolmen, ring forts and the moonscape look of the Burren are what most people see in photos and guidebooks on Ireland. 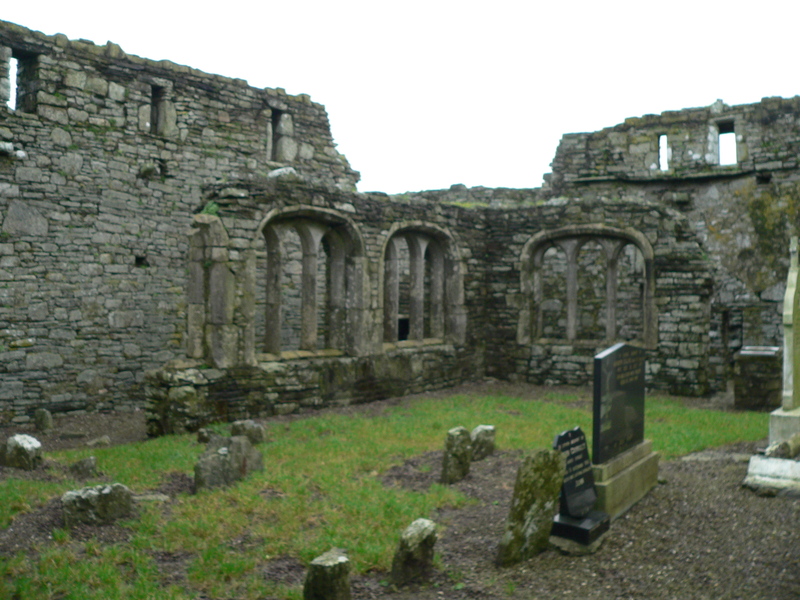 But the mystical ruins of Corcomroe Abbey are an equally important Burren landmark. This sacred ground compels the visitor to be quiet, devoted, contemplative … almost as is if the long-gone inhabitants were still there. 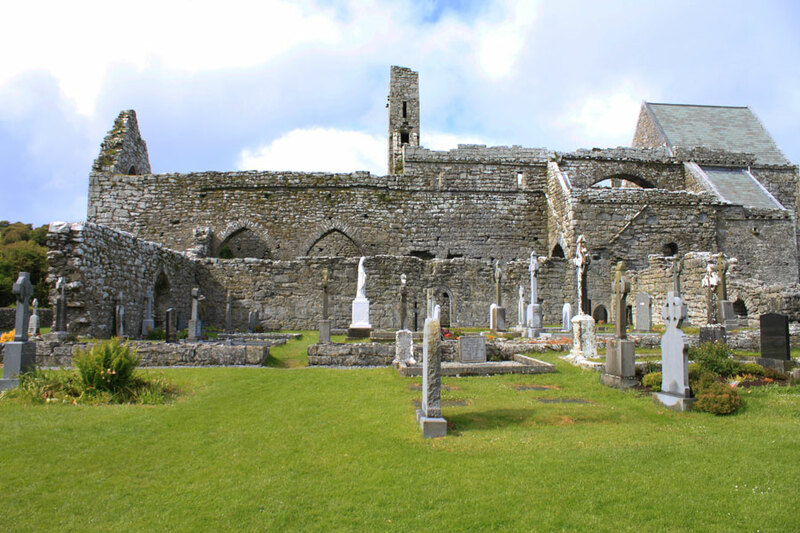 Originally, Corcomroe was a Cistercian abbey, set in the valley surrounded by the Burren’s barren hills that look as if all the grass and vegetation were scraped off with jagged glass. 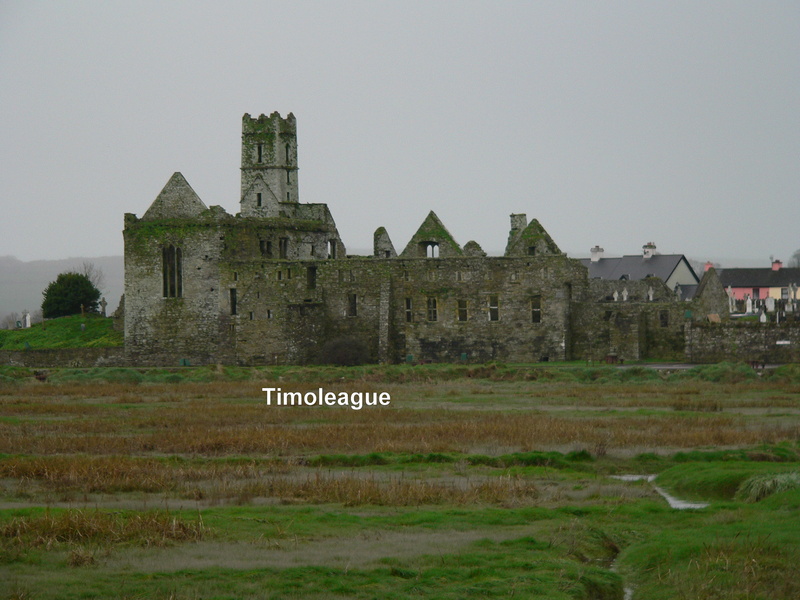 The abbey was built sometime in the late twelfth century. Access to the valley was through a pass in the mountains known as the “monks pass, ” and it was part of a fortified region guarded by a castle (now long gone). 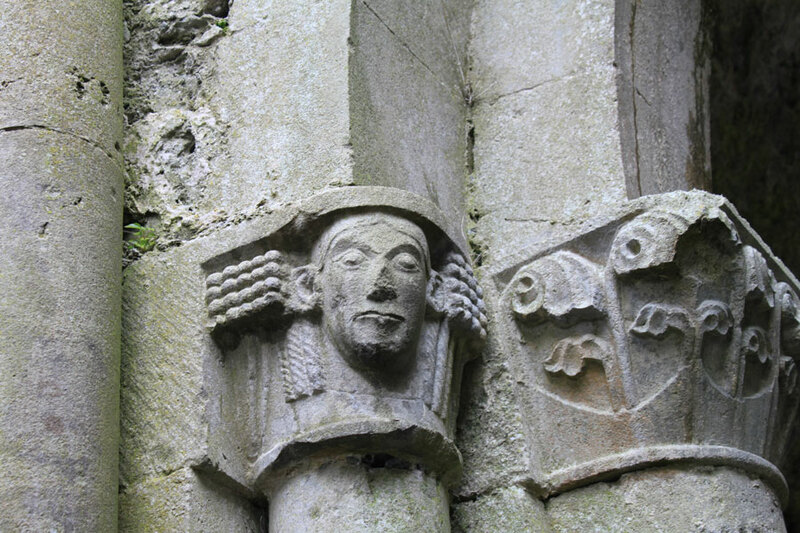 The fishbone pattern on the ribs that support the vaulted roof over the sanctuary, the effigy of a Chieftain king, the smiling bishop carved into a crumbling wall, carved faces and flowers resembling bluebells atop the large columns are all part of what makes Corcomroe amazing. 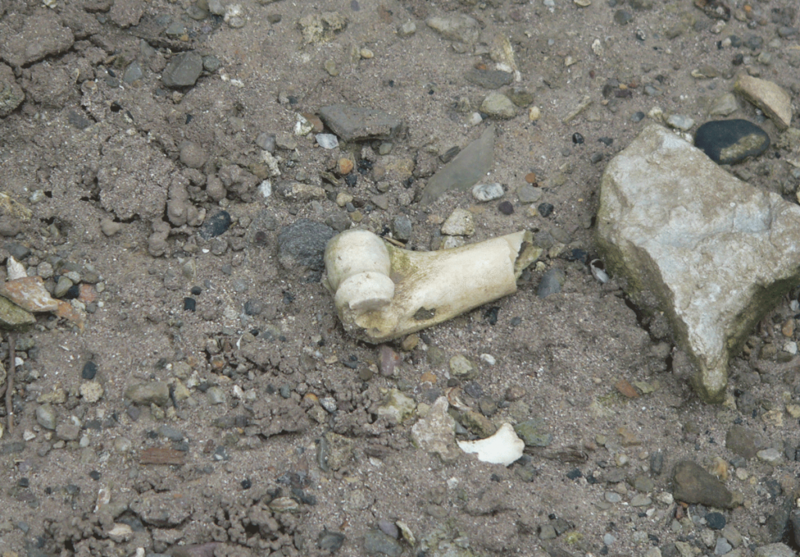 Corcomroe is a place to walk through slowly… to stop and notice the details. 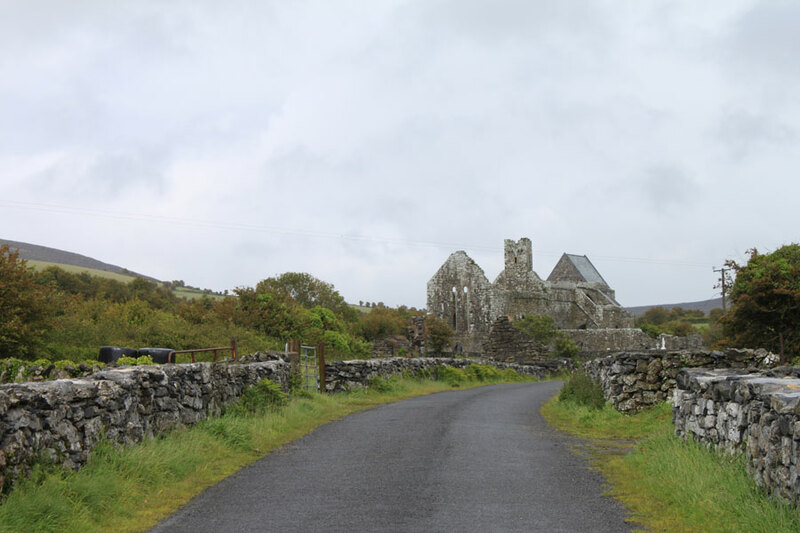 The Abbey sits just off one of the main roads that wind through the Burren. It’s easy to explore and has a strong sense of solitude. 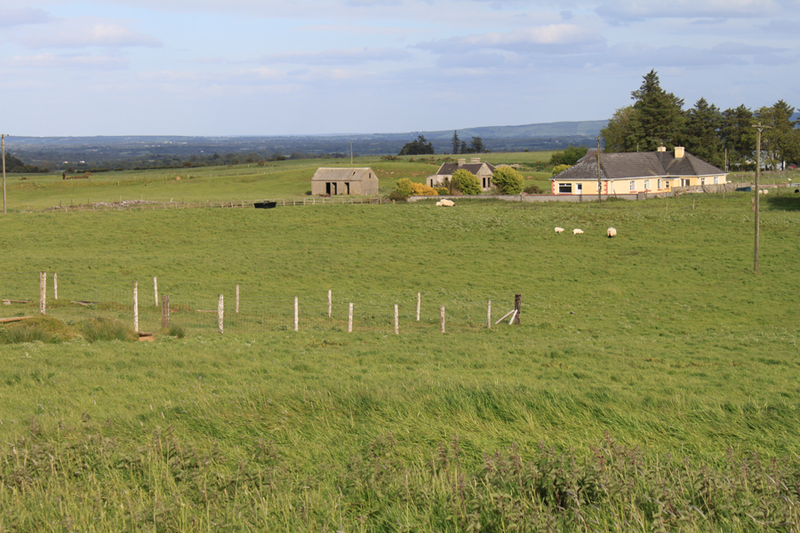 The backdrop of the mountains and small green fields still enclosed by abbey stone walls add to the solitude of Corcomroe. It has a haunted presence. Corcomroe projects its memories into the landscape and onto the pilgrim. 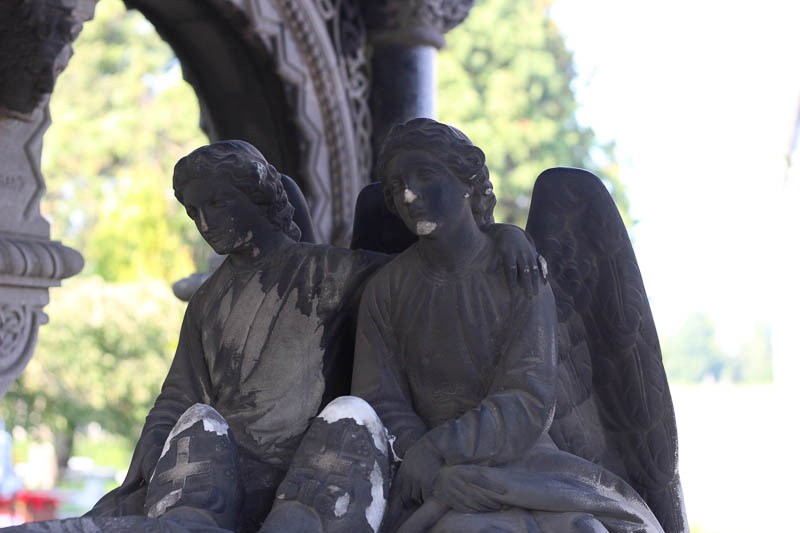 The setting is a perfect mingling of this world and the eternal world – the past and the present. Looking at the old ruins immediately draws the visitor into a rich past, but the new roof protecting a portion of the abbey is a contribution of today’s faithful – people who want to protect it and preserve it. …a community that values and cherishes it. Corcomroe shrine secured on the outside wall. 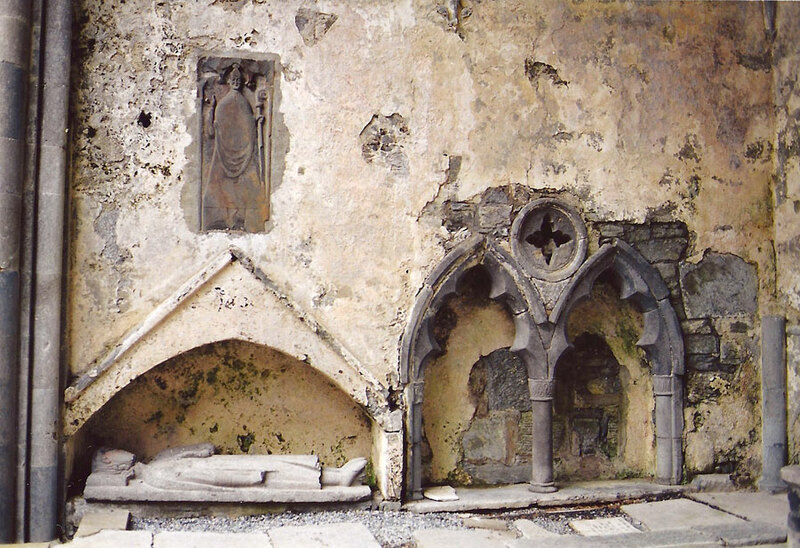 What’s left of Corcomroe is a historical spiritual remnant kept company by the local village’s faithful departed. 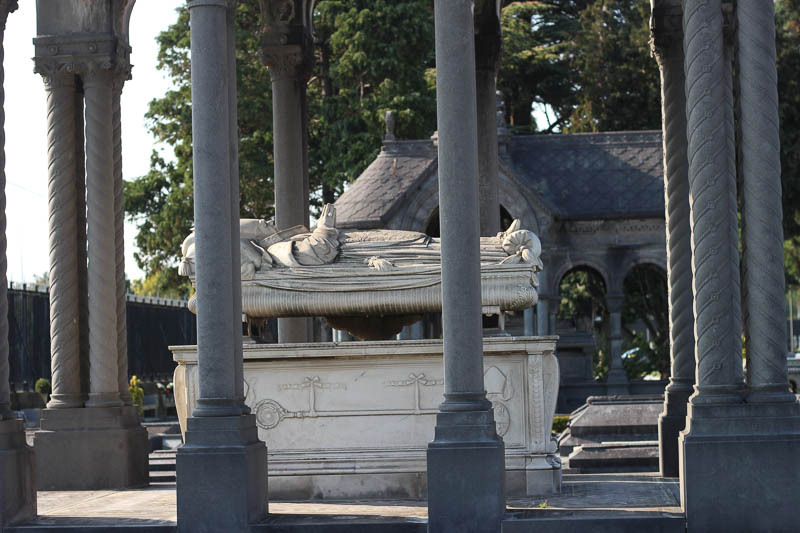 Graves are everywhere. But so are little hints and reminders of today’s faithful who come to pray, reflect and tend to the memories. Their presence is seen in the repaired grave slab, a makeshift cross, a new flower bed or a small shrine like the one pictured above. 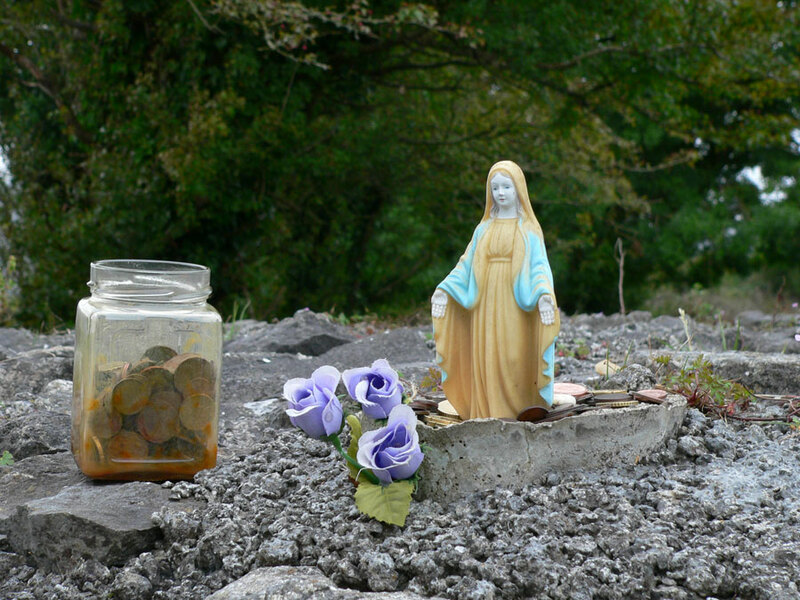 This plastic virgin Mary is secured into a concrete base. She was placed on the outer wall with three lavender silk roses and a glass jar. Coins left by devotees are both in the jar and at her feet. I took this photo in September of 2009. I returned to Corcomroe in May of 2011. The shrine was gone. Corcomroe is a thin place. It’s a lonely place. One of the few places in Ireland I can photographically remember is Kilshannig, a small dilapidated village on the Dingle peninsula at its northernmost point. 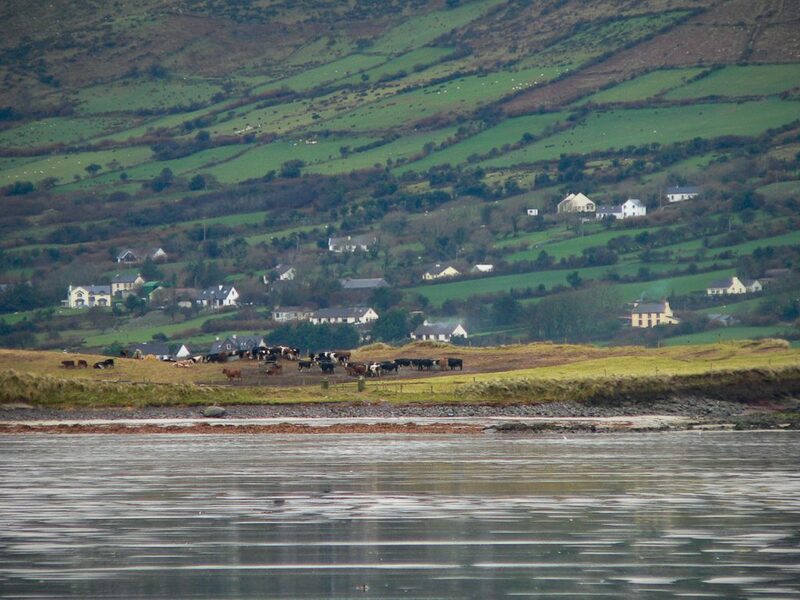 Most visitors that spend a day or less in Dingle seldom visit the northern route which has spectacular sea views, beautiful sandy beaches and commanding perspectives of Mount Brandon. 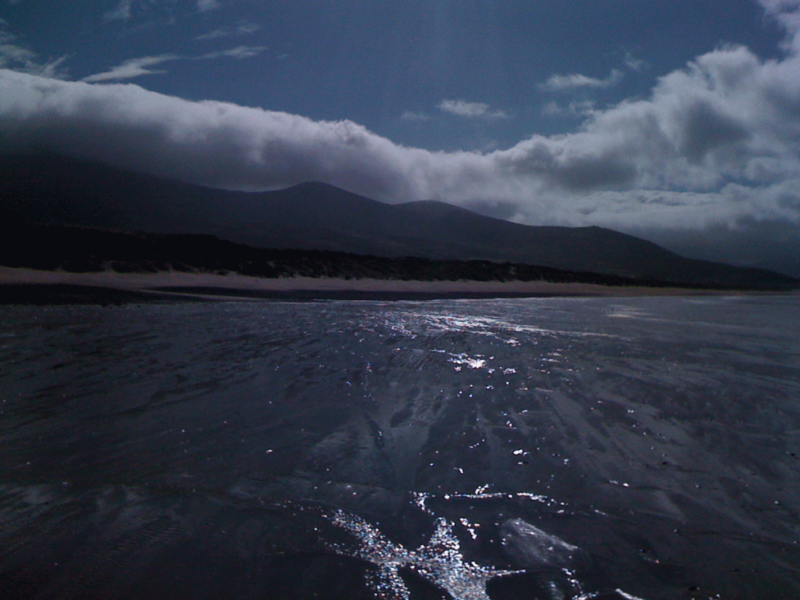 Just past Castlegregory is the turn-off to go out toward Rough Point. Kilshannig is a hilly village with a few small houses and narrow roads. We found cows wandering freely on the roadside and most of the buildings looked vacant. 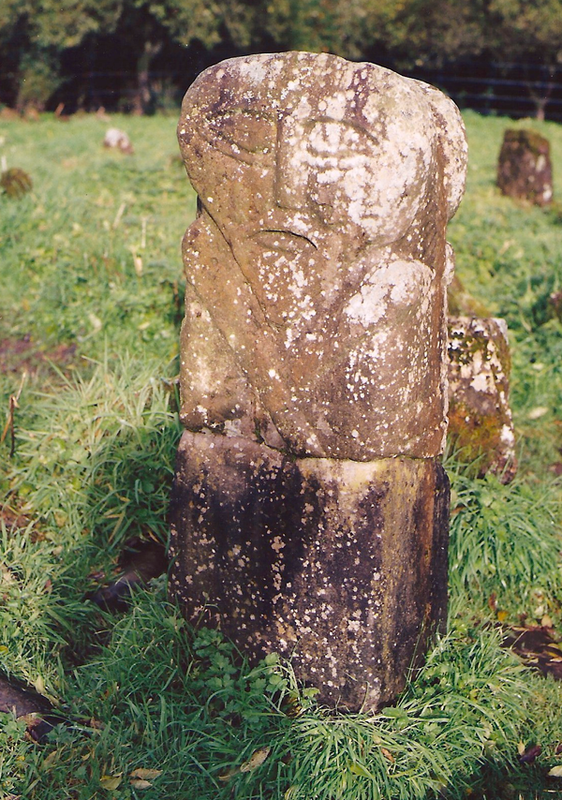 St. Senan or Seanaigh built a monastery in the Magharee Islands just off the coast of this village in the 7th century that was accessed by sea. A 15th century (some say earlier) church ruin now occupies the site at the edge of village overlooking Brandon Bay and the Atlantic Ocean. 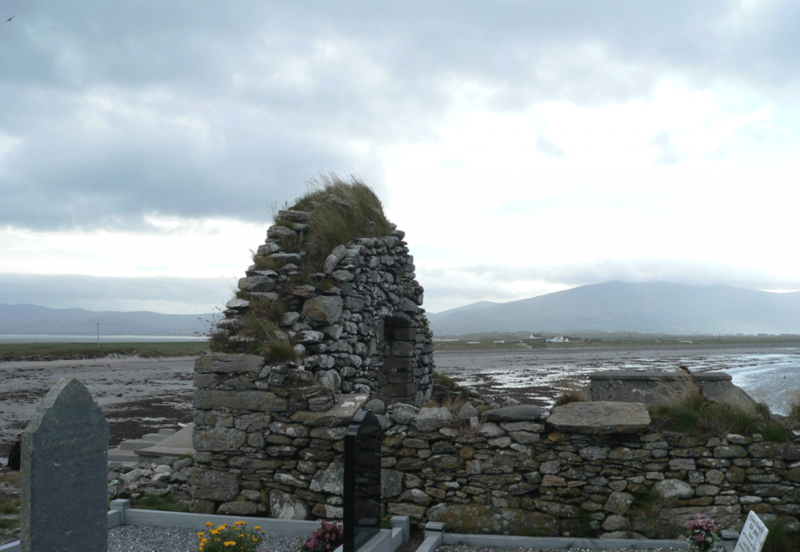 This little church was the mainland church for the monastery on the island. 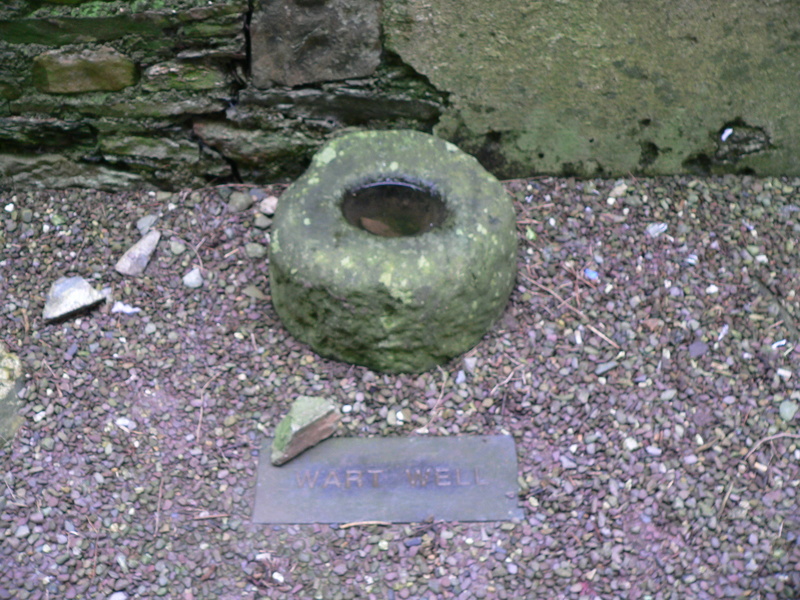 Inside the church walls is cross-pillar slab from the 7th century. It has a Greek style cross carved on it and has been white washed. 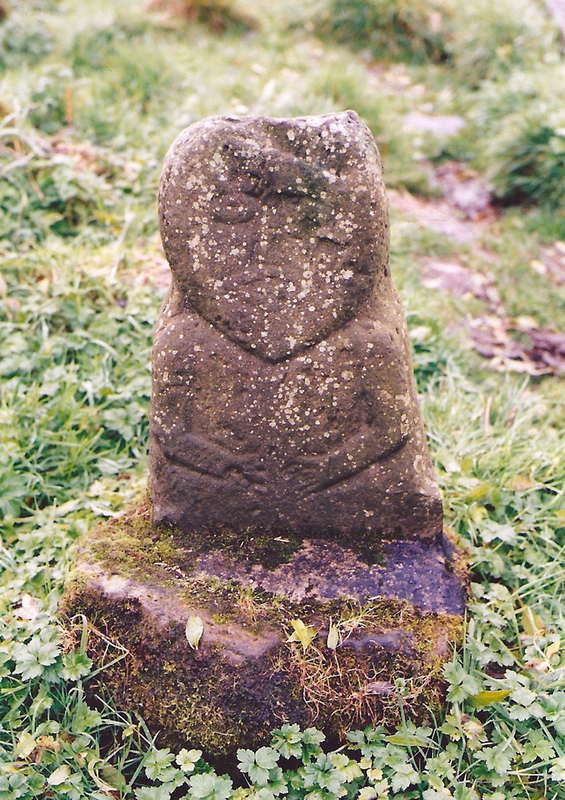 There are similar carvings on pillar slabs in Glencolmkille in County Donegal. 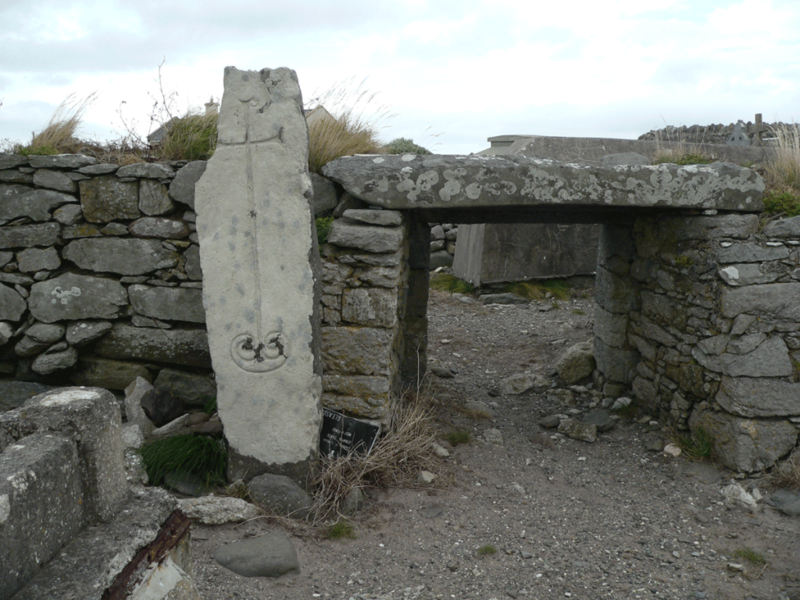 It’s believed that the slabs were part of a pagan ritual before the area was Christianized. This may have served as a wayside marker. 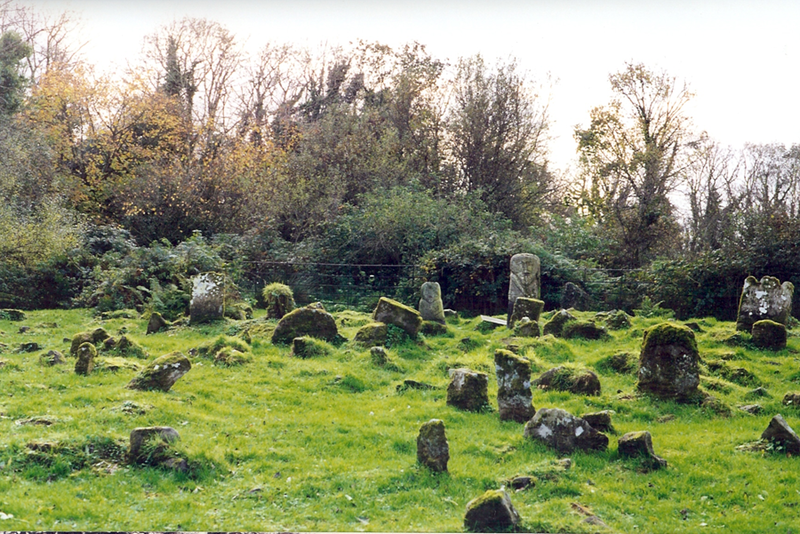 No one really knows for sure what these standing stones represented. What a remarkable experience to add one’s own hands to the collection of thousands that have traced the engraved path of the cross on that ancient stone. 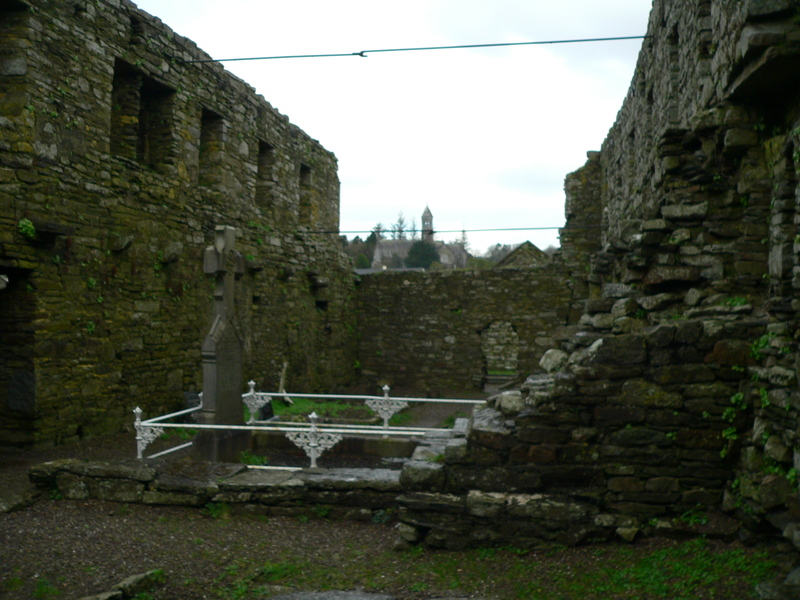 The ruined church was converted to a cemetery as were most of the church ruins in Ireland. 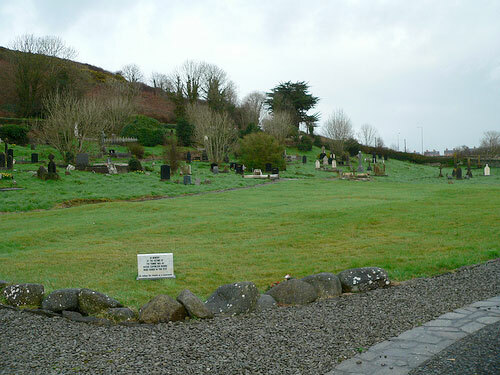 And though the church was built on high ground above the sea, Brandon Bay has occasionally eclipsed the banks and invaded some of the old graves. 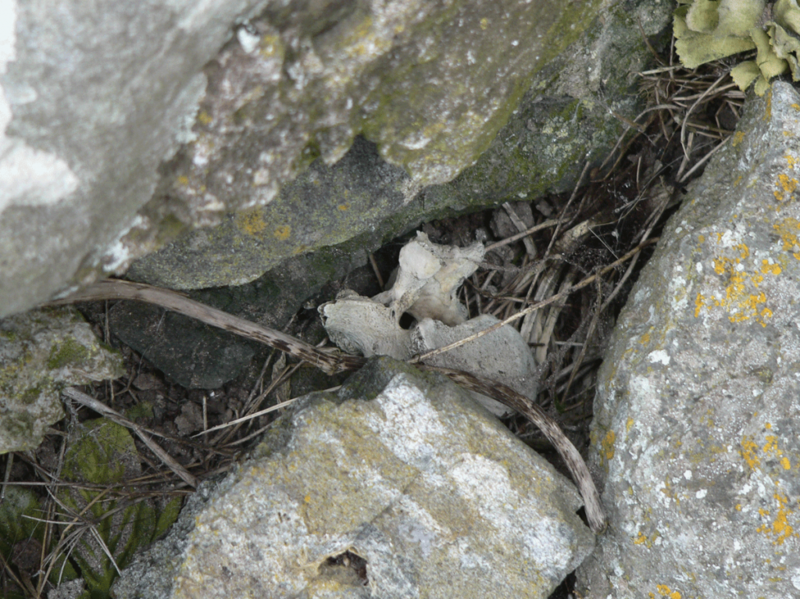 Bones have washed out of the graves and litter the area in and around the church. While it was a somewhat macabre site for us, it was also a reminder that our remains join all the elements of nature eventually. We all return to dust. We found some interesting green chards scattered in one place. 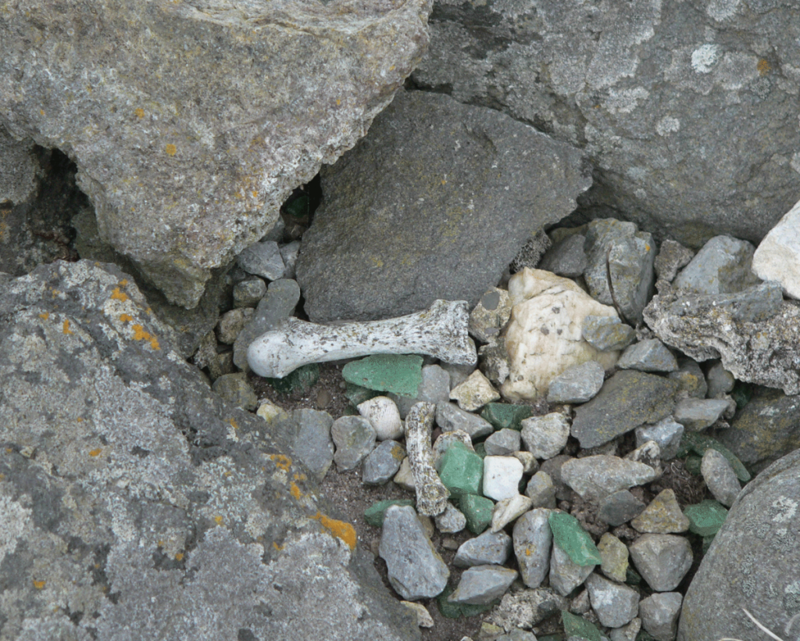 They had no sharp edges, either glass shards worn down by the sea or some type of stone. The views from Kilshannig are spectacular. Mount Brandon dominates the western view with Brandon Bay lapping up on a shoreline that extends nearly a half mile out to sea. In the distance, the crashing waves of the Atlantic Ocean can be seen and heard. The silence of the village – save for the wind and sea – is almost eerie. This is a holy place.